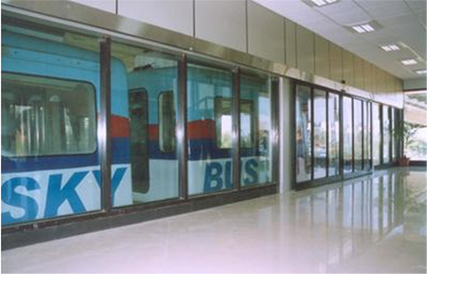 Atal Skybus Metro Technology Could Be the Befitting Gift from India to the World! It is rare for people like us, in the bureaucracy, to start admiring a politician. In my 35 years with the Indian Railways, I was fortunate to have had the opportunity to spend time with a few such exceptions who one could admire, for being totally dedicated to the cause of nation. And one cannot but admire. Atal Bihari Vajpayee was one such exception—he had the unique ability of putting people at ease in his interactions thereby getting the best out of them. I first had the honour of hosting Atalji as prime minister (PM) along with several cabinet ministers on 1 May 1998, as chairman and managing director (CMD) of Konkan Railway. It was a memorable experience because of the effort that Atalji put into ensuring that everyone was relaxed. 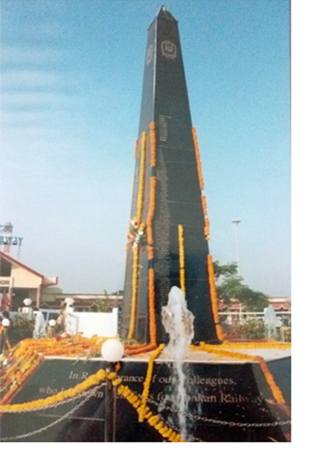 I used the opportunity to request permission to build a memorial at Ratnagiri for railway colleagues, who had laid down their lives for Konkan Railway with the protocol of a State salute at the memorial on 14th October every year. I was completely bowled over by the readiness with which he accepted my bold and unprecedented request. We started honouring the departed souls from that very year, and the tradition continues to this day. I have always been deeply disturbed by death caused by railway accidents. How does one ensure that train wheels remain on the track and never slip? We depend only on gravity and dynamic stability. There is no positive holding force between the track and the running wheels. A derailment or collision causes the wheels to go off track, causing coaches to capsize and be crushed along with people travelling in them. As a conscientious railwayman, I have tried to find a permanent solution to the problem. A three-year posting in Zambia gave me time to reflect on how to provide a positive hold between railway track and wheels. 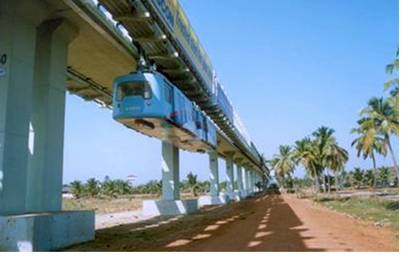 I wrote a paper titled “Skywheels -A New Mass Transit System” in 1989, which I presented at Bologna in Italy. 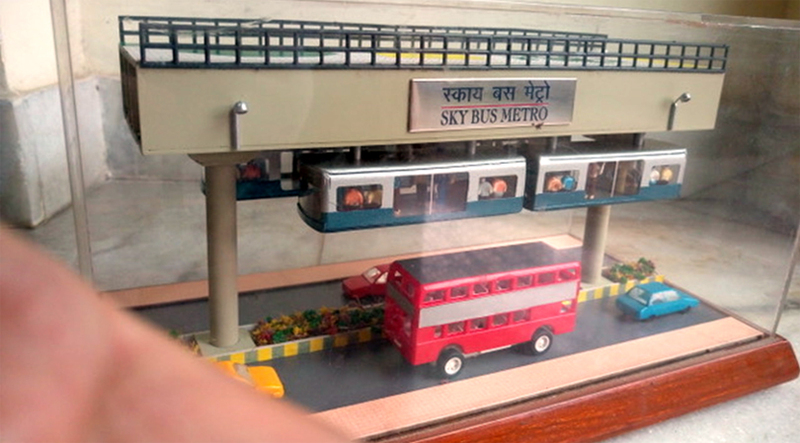 But it took upto 2001 to develop fully engineered Skybus metro. I did it in my private time while working on Konkan Railway and sent to the prime minister’s office (PMO) in 2001. I also approached TUV Rheinland, Germany, a renowned name in technical services for an independent assessment. I also requested Dr APJ Abdul Kalam, the then principle scientific advisor to the prime minister, who went on to become one of India’s best loved Presidents, to look at the project. His assessment was gentle but thorough. Armed with this and a positive assessment by TUV Germany added to my confidence that we could deliver and I thought it was time to meet the PM with my proposal. Finally, in 2002, the PM called me for a one-to-one meeting, perhaps based on advice of Dr Kalam. I had a 30-minute time slot at tea time with a gentle sea breeze for company and a model of Skybus Metro, which I had carried with me, placed on a teapoy between me and the PM. It was another memorable meeting and I had the PM’s full attention. One of his first observations was—‘oh, the coach will hang with the wheels on top’? I explained how the basic defect of the railways is derailment from the tracks and how this reconfiguration of the same proven railway elements, using tecnology can address the problem. The wheels are now constrained within a concrete box and the coach hanging below has no way to escape, roll off or capsize. He asked if the rails and bogie wheels are the same that we use on existing railway. I confirmed this. He then remarked, that it means only the swing of the coaches needs to be controlled. I agreed and told him how we have shock absorbers and restraints to control the swing. He then wanted to know how the coaches would change tracks after reaching the end of the track. I explained how the traverser arrangement would enable this. “That means we cannot have long trains,” said the PM. I explained to him that a long train is not the solution. A train often releases traffic on to roads, because railway commuters usually use a road vehicle to reach the station and do the same at their destination to reach home or office. I explained how shorter train length improves headway and, based on the rate of clearance, could ensure almost no wait time for the communter. Essentially, the Skybus will re-engineer and design the railway to make it more flexible and ensure it can follow the road and save transit and travel time, asked the PM? I was impressed—how quickly he was able to grasp the core of this technical and complex subject, which even railway experts struggle to follow. Atalji asked me several questions about emergency evacuation if the Skybus gets stuck at a height. I showed him this picture, which caused him to guffaw with amusement. It almost made me forget that this was the PM I was addressing. The PM asked why the Skybus would cost so much less than a regular metro design when the same components are used here too! It gave me the opportunity to explain various design and safety factors and how, by eliminating the risk of derailment and shock, we can have small stations, use light, safe coaches and reduce dead loads while increasing payload. He then asked about collisions that can happen despite our best efforts leading to loss of lives. I explained that even if the anti-collision systems fail, no two coaches will directly hit each other. The PM wanted to know if any similar systems exist in the world. I told him about a 100-year old hanging train in Germany—it runs slowly but does not qualify for high speed or mass transit. He also wanted to know who will construct the Skybus. I told him our own engineers and small-scale industry are fully competent to deliver. After hearing me out, the PM slowly stood up. I wanted to tell him about other benefits to the city such as reduction in pollution, but he smiled broadly and said that he was very happy to have spent the time on Skybus and asked me to go ahead with full enthusiasm because he would like to see shortly a running one. India can make it he said and added a few very kind words for me, which I will keep to myself. Instead of 30 minutes, the PM had given me 50 minutes and I walked out as if floating on a cloud and feeling blessed and encouraged. 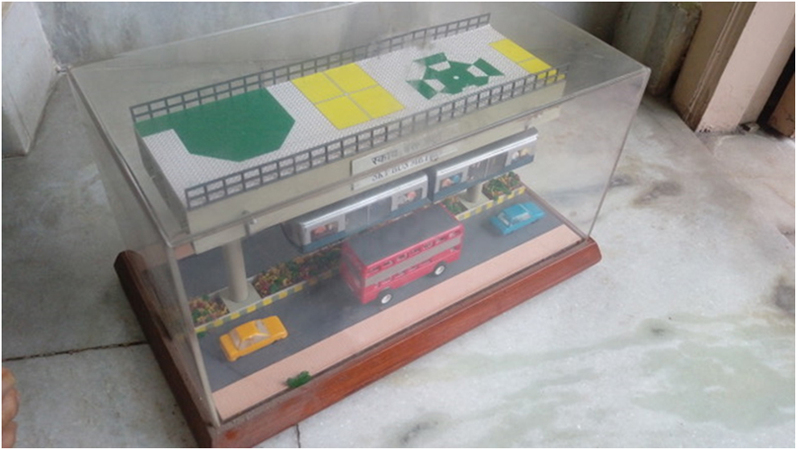 With Atalji giving his in-principle approval, we wanted a 100% full scale prototype manufactured as per specification, as a construction and demonstration model. But did not have funds. I took the unusual step of addressing various corporate chief executives (CEOs) to help us source various components for the Skybus, to our specifications and help us jointly create the first Skybus prototype in the world. It was to be unveiled by 15 October 2003, our Foundation Day at Goa. Konkan Railway provided land at the end of the first platform at Margao station. At a cost of just Rs7 crore, a world-class prototype, complete with a Skybus sation, smart card based gate access and bogies was constructed with the help of BHEL, L&T, Kernex, Patil Group, ICF and a long list of others. My mechanical, civil, electrical engineers worked day and night with the industry at their premises too to make it happen in such a short time this wonder. I believe this was the magic of Shri Atal Bihari Vajpayee’s inspiration and encouragement! The Railway Board, however, steadfastly refused to clear my request to spend the funds earned by Konkan Railway to set up an experimental track of 1.6km. In fact, the chairman of the Railway Board issued a written order directing me not to talk about Skybus in public or anywhere else, because it does not exist on the records of the Indian Railways and we do not know about it! 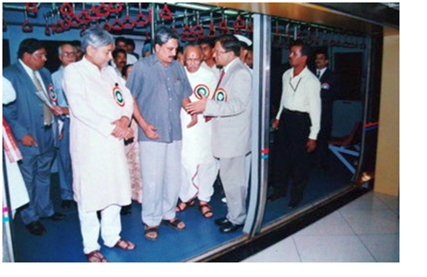 On 15 October 2003, the Konkan Railway Foundation Day was celebrated at Goa with railway minister Nitish Kumar, Goa CM Manohar Parrikar and the Governor present. They met the industry leaders who participated in our effort, went inside Sky station and Skybus and inspected the smart card systems and special lighting system provided by Bajaj inside the coaches and were openly amazed that India can do so much! I must mention that Goa’s chief minister Mr Parrikar, a visionary, wanted to set up a special purpose vehicle with Konkan Railway in 2004 to take the Skybus metro technology forward in the state and abroad. A formal proposal was sent to the railway Ministry, which ensured it was killed. Any experimental set up is bound to have over enthusiastic youngsters taking liberties. A mishap occurred on the uncertified system in one run by an over zealous engineer and a life was lost when one person was hanging outside an open door. It tested our systems to the extreme. Eight others inside the coach suffered no harm, there was no derailment of wheels, the coach remained hanging and did not capsize even though the high speed had caused it so swing beyond limits on the curve and it hit a column. In a regular railway line, this would have been a catastrophe; in the Skybus it was not, but it gave those who were gunning for the project an opportunity to call it unsafe. 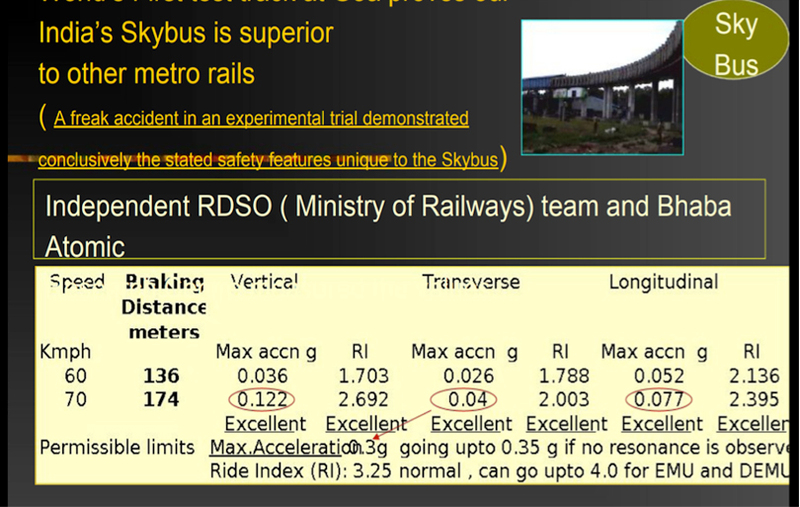 Be as it may, the a new Skycoach constructed as per railway codal practices, with the results being monitored by RDSO and BARC, and witnessed by CRS too, proved that Skybus metro techology satisfies all international norms for dynamic safety trials as given in the table. 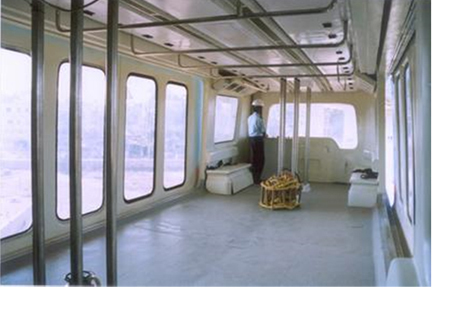 By the time I left Konkan Railway end-January 2005, a fully tested live working Skybus metro rail was ready for commercial adoption in India. All specifications and technologies were Indian and within competence of India. 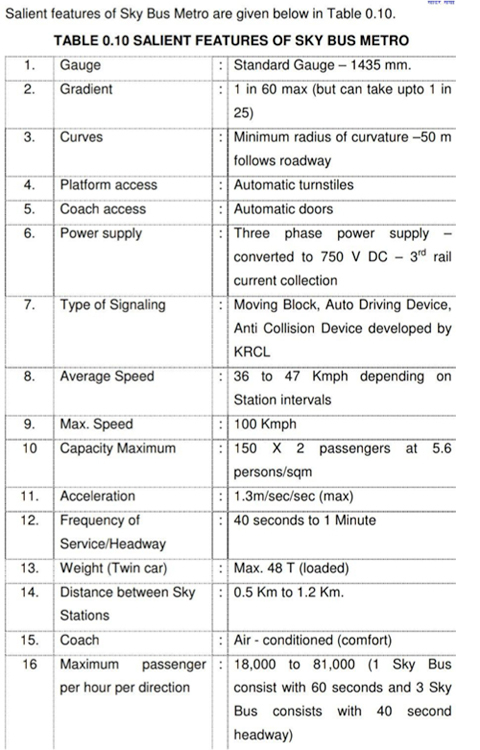 And as verified by CAG (Comptroller and Auditor General), the cost per km of double line including rolling stock and Sky station with platform screen doors, etc, was Rs38 crore. It was truly a fulfilling moment for me to find a solution to make the railways deliver a safer technology and economical solution that justified the trust that Dr Abdul Kalam and Atalji placed in me. It would be a fitting tribute if one could build the AtalSkybus as a tribute to the man who believed that it could be done in India. I cannot imagine such a project to be supported by the Utterly Bureaucratic Indian Railway BABUS. A large Company like L&T can promote it. The start cannot be in INDIA but some neighboring country. After its success there Indian Railway BABUS will, perhaps accept it. A couple of years ago I was waiting for my train at Madgaon station. In front of me was a large machine breaking down some columns supporting a structure. 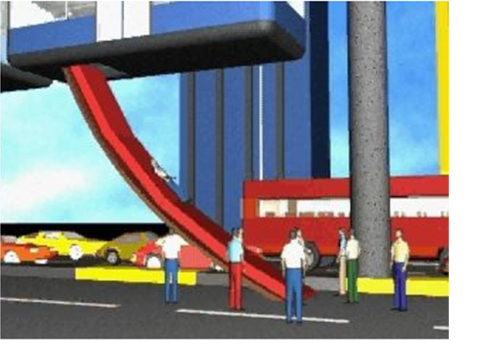 This structure was neither an elevated road nor for the metro. I now realise it could be the prototype Sky Bus Metro . 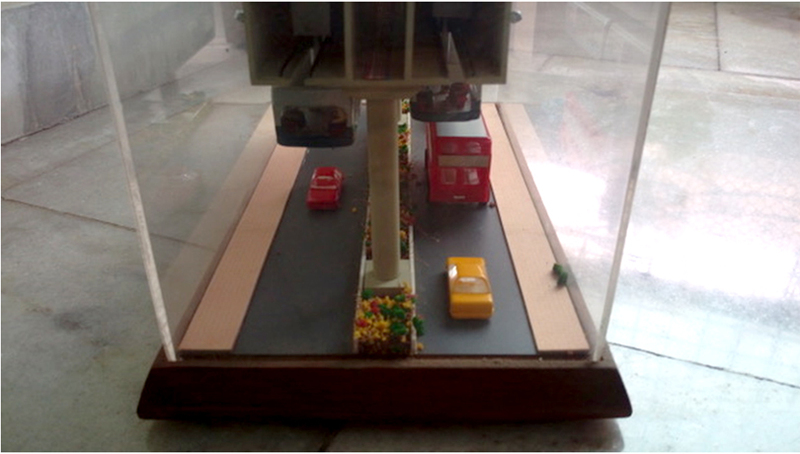 Many years ago, another railway engineer, Man Mohan Suri, developed a gearing system, the Suri Transmission. It had to be approved by the Germans for Indians to take notice of. 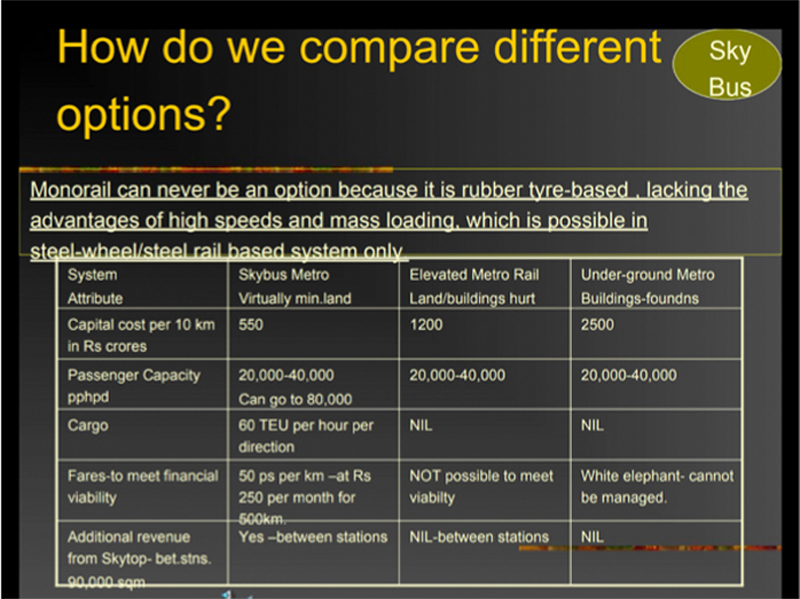 When the Skybus is such an excellent alternative with no possibility of derailing, why did the Indian Railways derail the proposal? Indian Railways will have to offer an explanation to the public. Sending a stern message to WhatsApp over unabated mob lynchings linked to the spread of misinformation on its platform, Union IT Minister Ravi Shankar Prasad on Tuesday instructed visiting CEO Chris Daniels to comply with the law of the land and take "suitable" steps to prevent misuse of the instant messaging platform. Prasad, in a brief interaction with the media after meeting Daniels here, said he also directed the WhatsApp boss to appoint a grievance officer and establish a separate corporate entity in the country. 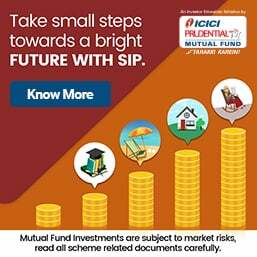 Fugitive diamond jeweller Nirav Modi, wanted in the Rs 13,500 crore Punjab National Bank (PNB) fraud, is in the United Kingdom, the Interpol has confirmed, prompting the CBI to seek his extradition, officials said on Monday. According to a Central Bureau of Investigation (CBI) official, the UK authorities confirmed Nirav Modi's presence in the country on Sunday through a mail on the basis of the diffusion notice issued against him by the probe agency to the Interpol. The official also said the CBI sent an extradition request to the Ministry of Home Affairs (MHA) on Monday. "The Home Ministry has also been requested to move its extradition request to the Ministry of External Affairs and through the MEA to the UK authority." Earlier on August 2, Minister of State for External Affairs V.K. Singh informed Parliament that the government had sent a request to the UK for extraditing Nirav Modi. On July 2, the Interpol had issued a Red Corner Notice (RCN) against Nirav Modi under money laundering charges levelled by the Enforcement Directorate (ED). Nirav Modi along with his uncle Mehul Choksi of the Gitanjali group is being probed in the fraud case by the CBI and the ED. 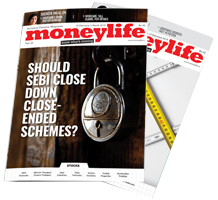 The ED had, on May 24 and May 26, filed prosecution complaints or chargesheets against Choksi and Modi. The court has taken cognizance of the chargesheets and issued non-bailable warrants against both of them.